Emergency safety goggles for disaster preparation. 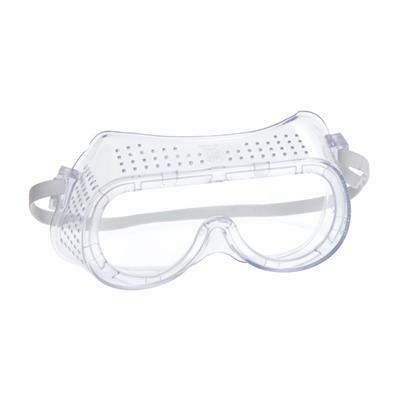 Emergency Safety Goggles offer critical eye protection from airborne objects and particles, chemicals and tools. Designed for use during and after a disasters, terrorist attacks or anytime to protect your eyes against severe conditions. Use these protective goggles following emergency situations such as earthquakes, hurricanes, tornados, tsunamis, winter storms, terrorist attacks, floods, fires, search and rescue operations, etc. for critical eye protection. They are adjustable, ventilated and lightweight for secure, customized, and comfortable fit. Dimensions: 7.5" x 5" x 7"
Protects your eyes from dangerous dust, debris or spray following a disaster. Instructions: Put goggles on your face with the strap behind your head. Adjust strap for comfortable and secure fit.